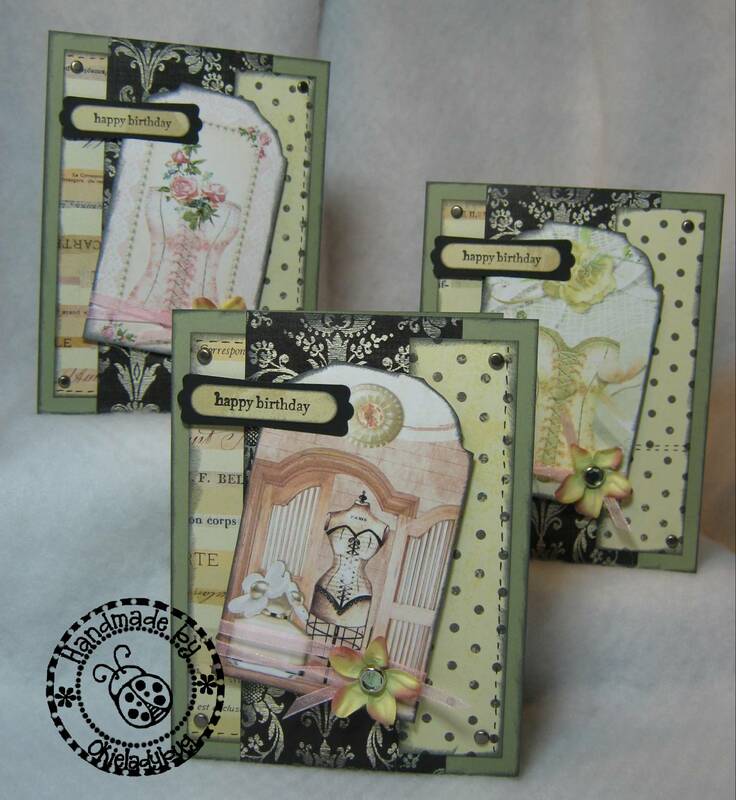 This set has less embellishment than the other two designs I did. I think I wanted the beauty of the tag to show through since they have less going on in the design. I haven't done the inside sentiment yet because I can't decide what to do. I want to do something about a girdle at our age...but not sure how to word it yet. Yep...that is K & Company Maison again. But the strip in the middle is some that I got at Hobby Lobby for a wedding project I did. I thought it went well with the papers and I had some scrap, so I used it! *okie is all about using the scrap*. 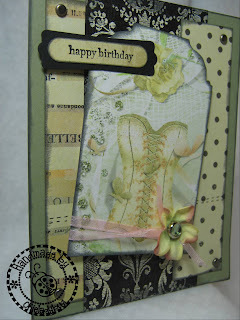 Speaking of using scraps! I have to tell you...Last night I was over visiting with Naomi and she told me she thought I was a hoarder! Can you believe the nerve of her! I told her I was not a hoarder, that I use my stuff but I just can't use it as fast as I would like because I have to work! Of course we both cracked up laughin at that one. She did tell me that I need to start selling my cards instead of "hoarding them in those boxes!" She can be so bossy sometimes! I did again put the tag on chipboard to make it sturdier. When you pop dot, if you don't know this already, you need a little more "body" to your paper or cardstock so the image will stay popped better. I wrapped the ribbon along the bottom of the tag and tied it off. I punched hole with my Crop-a-dile and then put the jeweled brad through the flower and then the hole. The sentiment is Stampin Up Teeny Tiny Wishes and the punches used were Word Window and Modern Label. And yes you did see those yesterday. *okie looks at her readers, shakes head, rolls eyes and sighs* AS A MATTER OF FACT I DO HAVE OTHER PUNCHES! But, I like them so just get over it! I am not sure if I will have anything to post tomorrow or Sunday. My friend Linda, aka LGuid, and I are going to the big city on tomorrow to run around. I just wonder what will happen on THIS adventure!! I love these cards! They are sooo cute! Okie, these are great. I love them. Wow really beautiful! Love the vintage feel! Oh how beautiful. I love these vintage tags. I can see why adding someything simple was just the right amount, especially since the tags themselves "appear" to have lots of embellishments on them already. They are so pretty. I really like your selection of papers for the BG too. 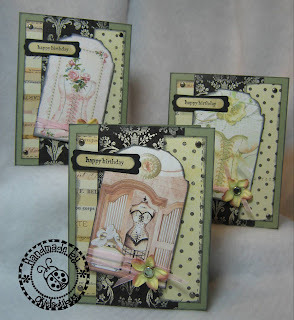 Okie you seriously need to do You Tube Videos to show step by step how you create your cards. These are adorable! To funny, "I told her I was not a hoarder, that I use my stuff but I just can't use it as fast as I would like because I have to work!" Now that is a sentiment to put inside of a card!Loving the cards! and Loving your blog each day, thanks for the laughs! These tags have turned out so very nice...you have a great knack for picking just the right papers and all.